When I was 6 years old I asked my dad how to fish for bass. That day my dad bought me my first fishing rod and reel. He planned to introduce me to bass fishing. Although he was not much of a keen fisherman himself, we grew lived in a part of South Africa where fishing and hunting were popular pursuits and most young boys were exposed to both at quite a young age. I still vividly remember the immense pride if felt in my new equipment and mounting excitement before our first fishing trip to a small lake on a neighbour’s farm. The anticipation I felt when arriving at our destination early in the morning was almost unbearable. It was a beautiful crisp autumn morning with the sun just rising, adding an amber tint to the clear water. On my very first cast, a largemouth bass of about 800 grams viciously attacked my little copper spoon about 5 metres from me and in full view of my incredulous eyes. To fully describe the moment is still very difficult after all these years; it was a mixture of surprise, awe, shock, exhilaration and triumphalism all rolled into one. Ever since that day I have been hooked on fishing, literally. I have targeted numerous species since, but bass fishing definitely occupies a very special place in my heart. I feel now have a treasure chest of experience when it comes to how to fish for bass. If you are just starting out at bass fishing, the amount you have to learn can seem daunting. But fear not, this is a basic guide on how to fish for bass. In this article, I plan to cover some basic areas of bass fishing which will enable any novice angler to approach the water with some degree of confidence. #4 – What Lures and Tactics Should I Employ? As with our other articles, the content is geared towards novice anglers but anyone and everyone is welcome. And I know anglers are an opinionated bunch so feel free to mouth off in the comments below! Bass, part of the sunfish family which originated in North America (bluegills are also members of the same family), have been successfully transplanted to various location all over the globe. The two most important species are the smallmouth bass and the largemouth bass (Micropterus salmoides). For the purposes of this article, I will focus on the latter. Their colour can vary from a very light yellow (in very muddy waters) to various shades of green, depending on the clarity of the water, amongst other things. They can reach a respectable weight which is determined by the available food supply and size of the body of water they inhabit. A good size bass will be anything from 2 kilograms upwards, although the Florida strain can weigh up to 8 kilograms. Bass thrive in water temperatures ranging between 60 and 75 degrees Fahrenheit (15,5 to 23,8 degrees Celcius) and can live comfortably in a variety of locations – from big freshwater lakes to small lily-covered ponds. I have fished for them in both and obviously, your tactics should be adjusted according to the geographic location you find yourself in. As long as there is adequate food supply, sufficient cover and a muddy bottom for breeding purposes, bass will survive and proliferate. This means that there are bass fishing locations within reach of a lot of aspirant anglers who are living in the countryside or on the perimeters of big towns or even cities. Because they are so ubiquitous and keen on taking artificial lures it is no wonder that they are considered to be such a popular sporting fish. As in most of my articles I want to emphasise that expensive tackle does not necessarily guarantee fishing success. Other factors such as knowledge about feeding habits, where exactly to look for them, when to fish as well as the optimum conditions during which to go fishing are by far more important. Having said that, one should obviously acquire quality equipment (within your budget) which will not fail you once a trophy specimen has been hooked. I am therefore not going to go on a detailed discussion about rods and reels and the pros and cons of different brands and types. Suffice to say that you need a good quality rod of about 2 metres and a matching fixed spool reel. By matching I mean not too big or too small in order to “balance” your outfit. When in doubt, however, opt for a smaller reel. Baitcaster reels are also very good, but not a necessity for casting artificial lures. I consider a fishing line with a breaking strain of around 4 kilos to be optimum for the task at hand. 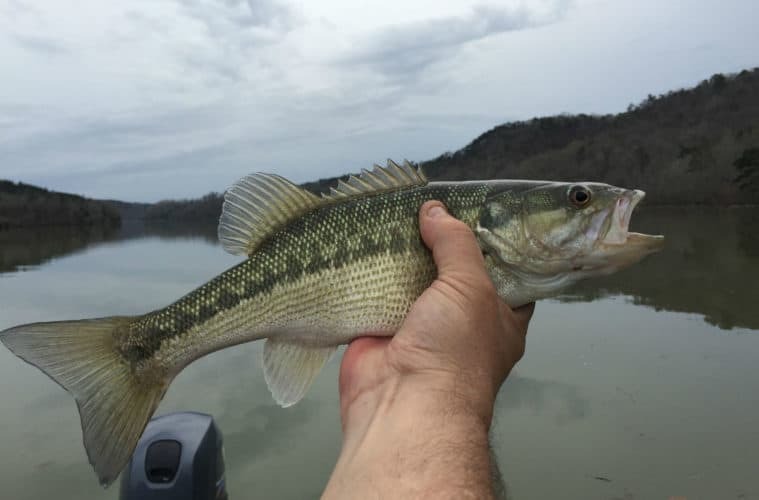 As already mentioned, one of the most important things to keep in mind when hunting bass is to remember that these fish are heavily structure orientated, both for protection as well as procuring food. They are not high speed, open water marauders, but rather lurkers and bushwhackers. Their favourite strategy is to wait patiently to ambush in or nearby an underwater structure like a submerged log or a clump of reeds. The moment any unsuspecting prey ventures too near, a bass will charge out like a bolt of lightning, opening that cavernous mouth and gulping down the hapless victim in a blink of the eye. You can therefore confidently expect bass to hang around water plants, submerged logs and rocks as well as any kind of man made structures forming part of their watery underworld. Therefore, even though you are new to a specific angling area, a good strategy is to be constantly on the lookout for these kind of structures. Cast your lure as close to this structure as possible and be on high alert for the first few moments during the retrieve, because that’s when strikes will mostly occur. In this article, I will focus mainly on four types of artificial lures namely spinnerbaits, crankbaits, poppers and soft plastics. Spinnerbaits are probably the most well-known and widely used of all artificial lures occupying tackle boxes of bass anglers the world over. The common denominator of all spinnerbaits is the presence of a spinning blade rotating a weighted cylindrical body. They can be different sizes and armed with either a single hook or a set of treble hooks. They don’t represent a specific food item, but are probably designed to catch the attention of bass by means of the vibrations created by the spinning blade. The tactics involved in fishing with spinnerbaits are not very complicated and involve basically casting and retrieving at a steady rate. The rate of retrieval, however, can be varied alternating between fast, medium and slow depending on the reaction (or lack thereof) to whatever tactic is employed at the time. Crankbaits are made of plastic, balsa wood or similar lightweight materials and are normally armed with two, or even three, sets of treble hooks. There are a vast array of different shapes and sizes. The two I mostly use is the one shaped like a minnow with a “lip” in front which gives it a wobbly action while being retrieved and the banana-shaped one (like the classic Lazy Ike) which acquires its underwater action from its peculiar shape. Some crankbaits are articulated, meaning the front and back parts are separated, which gives it an even more pronounced wriggly action. These lures can also vary between floating, mid-water and divers. Normally I hunt for bass in shallow to medium-range water and use divers only when fishing really deep areas in order to get the lure down to where the fish may lurk. Crankbaits can be retrieved in a variety of ways in order to simulate a wounded or panicked bait fish. Anything from a very fast retrieve, making the lure skittling on the top of the surface, to a slow, jerky, stop-start action may do the trick. Again, don’t be afraid to experiment with different retrieves, but keep in mind how a natural prey may perform under those circumstances. Poppers are strictly topwater lures, designed to float on the surface to imitate either a hapless bug stuck in the surface film or an injured frog or mouse. Under certain conditions (especially still, warm evenings) a popper fished the right way can be lethal and few things beat the heart-stopping moment when a big fish, seemingly out of nowhere, suddenly breaks the surface to violently attack a stationery popper in a cloud of spray. My favourite time for fishing poppers is at dusk when the sun is dipping away beyond the horizon and the evening insects start making their appearance. During this time of the day the wind will often die down and the water surface will become smooth and placid. Pitch out the popper, give it two or three short twitches and leave it at that. Lots of anglers lose patience when there is no reaction after a few seconds and will continue retrieving with some pauses in between. That’s where they make a big mistake. I have waited for up to two minutes and beyond for a fish to eventually take the stationery popper. It seems a hungry bass can ignore such a tantalizing, seemingly incapacitated bonanza for just so long before succumbing to its natural instincts. Like I said, an attack on a popper can be quite spectacular and is, to my mind, one of the most satisfying ways to fish for bass. For soft plastics, you normally need a specially shaped hook to insert through the plastic worm applying the well-known Texas rig, a quite straightforward method. If you are not sure how to do it, check out a demo video on the internet. As far as tactics are concerned this one differs considerably from the others mentioned above. After you have identified the spot you want to fish, cast out the plastic bait and allow it enough time to settle to the bottom. You then slowly move your rod tip about a metre parallel to the ground. This will result in the plastic bait “crawling” towards you over the bottom. Next you take up the slack in the line by slowly retrieving thereby allowing the bait to “rest” for a couple of seconds in the same position. Once you have taken up the slack, you repeat the process. By continuing with this process you ensure that the plastic bait imitates a creature slowly crawling across the bottom with intermittent “resting” periods. Most of the strikes will occur while the bait is in the “resting” position, so be on the alert especially while retrieving the slack line. Sometimes the fish will follow the bait and attack at the very last moment; seemingly due to an instinctive fear that the quarry will escape onto dry land. Because the soft, plastic body apparently has a more natural feel to it, bass will not easily spit it out (like other lures) even though they are not hooked during the initial pickup. This will give the angler extra time during which he/she can set the hook after the fish grabbed it. Having grown up on a farm fishing for bass and eating them on a regular basis, I am probably a bit biased when commenting on their gastronomic properties. Suffice to say that I find bass to be a top table fish with beautiful firm white flesh which can be cooked in a variety of ways. My mom used to place the scaled and gutted fish in an oven pan with butter, cover it with aluminium foil and bake it for 20 to 30 minutes. In subsequent years I filleted them, sprinkled the fillets with salt, pepper and assorted herbs and grilled them Cajun style on a smoking hot cast iron griddle pan. I also acquired a small box smoker (for trout initially) and can truthfully testify that a smoked bass is one of the best-kept secrets out there. Again, if you love eating fish, you can do much worse than keeping one or two fish around a kilo for a hearty meal. Our fishing environment would have been so much poorer in the absence of this versatile, sporty and hard fighting fish and I salute them as a species. They gave me endless hours of joy and excitement through the years. So, make sure you give bass fishing a try if you haven’t done so yet. and I hope I have taught you little about how to fish for bass. Once exposed to the thrill of hunting this exciting quarry I can guarantee you will definitely want to get back to the water as soon as possible. I’m a big believer in jumping in at the deep end, and there is only so much reading you can do. So get out there and actually try to catch a bass. We welcome healthy debate here at Go Fishing Go. Few fishermen agree on tactics and we are by no means without fault. So if you think you have something constructive to add to the conversation then please comment below. Enjoy!